Christina Pirello, known for her cookbooks and PBS show Christina Cooks, has launched a brand new cookbook, Back to the Cutting Board. I first met Christina on the Holistic Holiday at Sea Cruise and was so excited about her easy and delicious recipes. She shows us that anyone, trained or not, can make healthy, delicious recipes in less than an hour. Reprinted with permission from Back to the Cutting Board by Christina Pirello (BenBella Books, 2018). 1. In a soup pot, combine the olive oil, onion, and garlic over medium heat. When the onion begins to sizzle, add a pinch of salt and sauté until they are translucent, about 3 minutes. Add the celery and a pinch of salt; sauté for 1 minute. Add the carrot and a pinch of salt, and sauté for 1 minute more. 2. Add the lentils, kombu (or bay leaf), and water. Bring to a boil, uncovered, over medium heat. Boil for 2 to 3 minutes. Add the corn to the soup. Cover; reduce the heat to low, and simmer until the vegetables are soft, about 40 minutes. Remove a small amount of liquid and stir it together with the miso until it is dissolved. Stir the miso mixture gently into the pot and simmer gently, uncovered, for 3 to 4 minutes to activate the enzymes in the miso. Stir in the parsley, basil, and rosemary; remove the kombu (or bay leaf) and serve hot. COOK’S TIP: I like to make this soup in big batches because it freezes so well. I also love to make it spicy on occasion by adding crushed red pepper flakes. Err to just a pinch if you’re not into spicy flavor, but if you like it, go ahead and season to taste. 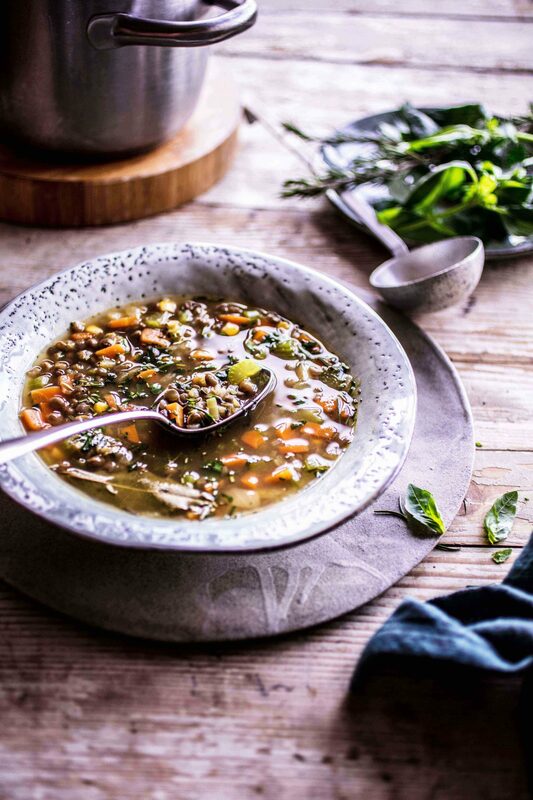 Let us know what you think of this easy vegan recipe: Lentil Soup with Fresh Herbs!